Linda Grimes: Visiting Reality : Bunny or Hamster -- which are you? No, I'm not talking about food. I'm talking about reading. I know, I know...but I couldn't find any pictures of cute little animals reading books, so I chose to go the metaphorical route with the illustrations. Besides, who can resist a cute little bunny or hamster? Those ears? Those tiny, twitchy noses? And the whiskers...OMG! To narrow the question down even further, what I really mean is, reading a particular author. Say you find a book you really enjoy. Do you immediately try to track down other books by the same writer, or do you spread out the enjoyment, only reading another here and there, interspersed with other books? A related question: do you like to mix up your genres, or feast on one until you're good and sick of it before you switch to something else? I am a gorger. Man, when I find a new author I really like, I will stuff those books down like there's no tomorrow, and weep with frustration when I run out. Right now I'm in the middle of a Kristan Higgins smorgasbord. In the past week I've read Just One of the Guys, Too Good to Be True, Fools Rush In, and am in the middle of Catch of the Day. I blame Tawna Fenske, who got me going on Higgins with this post. I downloaded Just One of the Guys, planning to keep it in reserve for when I didn't have anything better to do. Didn't think any more of it until four or five days later, when I sat down to give my overworked typing fingers a break. Honestly, I don't know how I haven't managed to read these books before. They are hilariously romantic, and I do love me some good romantic hilarity. It's going to be depressing as heck when I catch up to, and finish reading, Higgins' most recent novel, My One and Only, but at least my appetite for rom com should be sated for a while. I did the same thing after I discovered Harlan Coben. Plowed through his Myron Bolitar books first (love-love-LOVE Myron, and his batshit-crazy sidekick Win), and then moved on to his others. Same for Charlaine Harris's Sookie Stackhouse books -- I practically inhaled them. Are there any authors you find particularly Gorge Worthy? Or do you nibble your way through your To Be Read pile? So...BUNNY or HAMSTER? Come on, tell. I wanna know if I'm in the majority or not. Yeah. Bring it, baby. It's BUNNY v. HAMSTER SMACKDOWN time!! I tend to write too much to read a great deal other than for research. That said I usually have three or four books 'on the go' that I can dip in to now and then. Thank goodness for a good memory. Interesting question. I think the only author I've ever really gorged on was Peter Mayle. Love him. Want to be him. Sometimes a Regency romance author will tickly my fancy with a series and I'll read through it all but then am so disappointed when I've read it all that I get depressed. So I try not to do that anymore. Eeep. My comment was eaten. I Love Kristan's books! But I haven't read her new one yet. Total hamster. When I read it's A LOT. When I enjoy an author I track down everything (although I may not read it all, depending on how it looks). I don't get depressed after finishing everything an author has out, although if I was really into it I might get vaguely irritated that there isn't more. Then I go through periods of not reading much of anything other than the back of the cereal box. As for genre, my interests are all over the place (both fiction and nonfiction) and sometimes I feast on a genre/topic, other times I skip around quite a bit. Anyway. Yep, I'm a gorger as well. I love nothing more than a good backlist quest! JR Ward, Suzanne Brockmann, and Charlaine Harris are all high on the "writers I went batshit crazy over and gorged on" list. I loves me a series with long story arcs! Both. (Yeah, I'm always this difficult.) I've devoured some authors, others - even those I like - I've...moved on after a book or two. I flip genres, but no matter the genre I like it to have a strong romantic aspect. Lucky for me, I found DG late, and only had to wait for Echo. That was a hell of a wait. Haven't done LJG, though, and don't intend to. Have you? I'm in the vast minority, but I just can't get into his character for some reason. I suppose you won't believe me if I try to tell you that I'm a bunny? Well, you shouldn't cuz I'm not. Example: Two years ago, I FINALLY caved into a friend's suggestion that I read both Janet Evanovich and JD Robb. I read damned near 45 books in a little more than three weeks (15 Evanovich Stephanie Plum books and approx 30 IN DEATH books)...coincidentally, this was the same year, I inhaled all the Sokie books, and now *sigh* I must wait on all three authors for new ones to come out (which i usually read within a day or two of release and then I'm in the same boat all over again!) It's a vicious cycle, I tell you. VICIOUS! 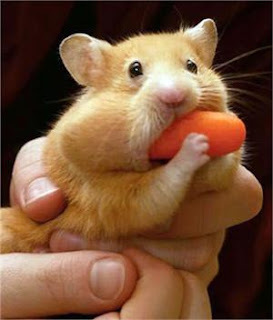 Definitely a hamster here, both in reading and in eating. :) Just over the last 4 days, I read 8 books. :) What can I say? Nothing better to do. And yes, I tend to plow through authors, if I can. I also jump genres like a flea jumping...er, hamsters? Rabbits? I'm with Karla, on Evanovich and JD Robb. I've just finished rereading Janet's 1 through 16 so I'm primed and ready for 17 which comes out in a week or two. I love rereading a series one book at a time, but in Hampster mode. I only nibble on books and authors that others have recommended and I'm just not that into. When I read, I dont mess around. But sometimes I do torture myself by using a book as a reward for pages written or a book revised. I used to be a hamster - I started the In Death books when there were about 12 and read them all in a couple of weeks. 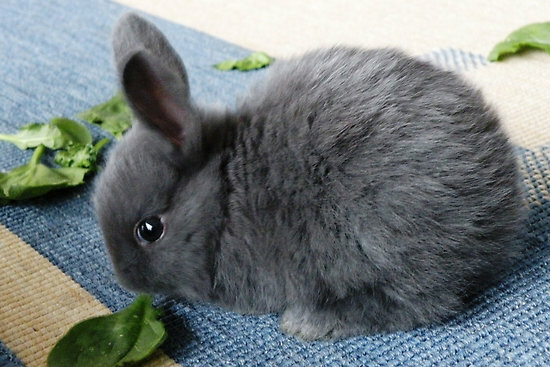 But now I'm a deliberate bunneh. I've been alternating paper books with ebooks, to bring down both piles. And I've started making sure I alter genres. Seems to be getting me out of a reading rut. I've been more of a nibbler lately, and I think it's because I've been reading SO MANY debut authors that I follow on Twitter. I fully expect that to change in years to come as they have more offerings on the market. I will absolutely read anything Carrie Ryan puts out there because her prose and living, breathing world in the Forest of Hands and Teeth books snatched my soul and is holding it captive. Love her! Like you, if I find an author I like, I read everything they have out. Once I catch up to the backlist, the waiting seems interminable. Lois McMaster Bujold writes gorge-worthy fiction. You can usually find her in the SF/Fantasy section, although I don't really consider her writing characteristic of the genre. Even if you're not a big fan of SF/Fantasy, she's worth a try. Circumstances make me a nibbler (no new books for a while) but at heart I'm definitely a gorger, although only with authors. I genre hop all the time. i'm not really sure which i qualify as, probably a mix. a bunnamster. or hammy. because i don't usually gorge myself on one author all at once, but if i love an author, i will read everything they've written, it's just over a longer period of time. sometimes, reading one author's work all at once can be a bit repetitive, so i want to lengthen the time between reads so each one feels fresh. Jennifer -- Oooh, I haven't read any Lisa Kleypas yet. Dare I start? Hmm. Maybe I better wait until I'm off my Higgins bender. Sue -- Well, "depressing" was probably a strong word for me to choose. But I definitely feel let down after a whirlwind romance with a new author ends. Teri -- Aren't Myron and Win yummy? And, yeah about those long arcs. Love 'em. Tara -- You are so lucky you didn't have to wait between DIA and Voyager! Ugh. That was excruciating. I've only read one LJG book so far (Lord John and the Private Matter), which I enjoyed, though it's grip on me isn't quite as strong as the Jamie/Claire books. Karla -- Nope, wouldn't believe it for a second. You're a hamster all the way. ;) And, yeah, it is a vicious cycle. Katt -- Love Evanovich, too. Aaah, Ranger and Joe. Yum! K-pop -- (Tee-hee. Still love that.) Enjoy your gorging! Diane -- I've actually been putting off starting Bujold because I know that gorge-fest will take some serious time. I'm a total gorger! Right now it's Charlaine Harris, a few months ago it was Tess Gerritsen, and before that, Lisa Kleypas! It's so fun coming across an author you love and discovering a backlog of his/her books! Kristan Higgins is great for gorging, since the books don't tie together. I read the first four books in Gabaldon's OUTLANDER series and then tore my hair out frantically while I waited for the next one. I decided I don't want to repeat that agony, so I'm waiting until she's totally, 100% completely done before I buy the next book and dive in! Lindsey -- Aaah, I have such fond memories of the week I devoured Charlaine Harris's backlist. So much fun! Tawna -- You are wise to wait for the rest of Diana's books. Thought I was gonna DIE when I reached the end of AN ECHO IN THE BONE (her latest one). Almost as bad as the cliffhanger in Dragonfly. Cheese-Louise, but that woman is cruel! I'm with Abby Mumsford - I'm a mix. Though I think I prefer the term bunster :). Take Janet Evanovich - I love her books but can only read 2-3 back to back. Then, after a longer break, I'll enjoy the next books even more. In the meantime I jump to another favorite author of mine and devour several of his/her books. Rinse, cycle, repeat. I often jump genre during this process too. But no matter what, once I've found someone I like I try to get my hand on every book from said author. So far I've resisted Diana Gabaldon's Outlander series, even though my mom buys each book as soon as it comes out and tries to get me to read them too. It helps that she only has them in my mother tongue and I prefer to read stuff in English nowadays. But I fear once I start I won't stop until I'm done. And guess which books I bought last week? The 4 Kristan Higgins books I hadn't owned yet (Why? Well, because of a certain post by a certain Tawna Fenske, of course). Anyway, I'm currently giggling my way through Just One of the Guys - it's fabulastic and it doesn't hurt that I recently let Muse write down the things she's interested in most with firefighters coming up surprisingly often. Definitely a gorger. I've always been unable to resist tracking down every last book by an author I've just discovered -- even if I had to drive all over the county to hit bookstores that had the book in stock. Then came Amazon. Aaaaaaaaa ... (That's angels singing). Now I don't even have to leave my chair. I love those pictures. Now when I see them in my mind, I'll remember what you "said" in your post! Sometimes I nibble, sometimes I gorge on a book. Depends on the book. The Kristan Higgins books sound wonderful. You've introduced me to a new author! Thanks. Total gorger. I love finding a series with many books, and I'll read them one after another...while popping m&m's one after the other. Hmmm...I'm sensing a disturbing pattern here. Dianne -- That's it with me--no willpower. When I really like a new author, their backlist is like a bag of potato chips to me. There's no way I'm stopping at one. I'm a gorger. The more novels by an author the faster I empty my wallet. If I happen to like the book of course. My last few splurges have all been because of Tawna Fenske. I would have never thought to read the authors if it hadn't have been for Tawna Fenske bantering with them on twitter (Jeff Somers, Bill Cameron, etc). Sometimes a gorger - when I discovered Julia Quinn I gobbled up everything she wrote. Now I have to wait a year before she comes out with her next book. Same with Sarah Dessen. And I discovered the Outlander books the same way you did, Linda. The first one blew me away so much I couldn't imagine waiting for the second. Now the battered copies will never leave my bookshelf. So, yes, if a book blows me away I'll grab one of the backlist - but it's that second book that has to really hook me. Consistency is everything to gorging. Nelsa -- Julia Quinn? Uh-oh. Haven't read her yet, either. Do I sense another gorge-fest on the horizon? True about the second book -- it has to grip me as much as the first, or I have no trouble stopping. Oh gosh. I think I am like you. I tend toward gorging. Especially with a specific book. I almost have to pace myself and not pick up a book except once every few days, because once I start I almost can't ever put them down. And when I get on an author I like, my week is just GONE. Bess -- Ah, yes. "Reading Time." The clock moves so much faster when there's a book in your hand. I am a gorger, too. Can't get enough and want to read the whole lot. I was one of those that discovered Diana Gabaldon late so I was able to go from one book to the next. My family thought I was crazy for a while as all I could talk about were Jamie and Claire's adventures. I may or may not get a little too involved with the stories. Glad to know I am not the only one that has an obsessive nature when it comes to reading!